Submitted by ToddMFP on Sun, 01/13/2008 - 02:00. I read some old post from 2003 on a guitar like this on this site and some people said it was pretty valuable after doing my research it seems to be quit rare anybody have any clue on the truth about this guitar before I start rebuilding it. If its valuable im not touching it if it its worthless im gonna fix it so i can play it. Posted by glw on Tue, 01/15/2008 - 09:57. Never heard of them. It looks kinda cheap, but I've seen pics of a very similar looking Teisco guitar and those are certainly quite collectable. Hey, it's complete with the tremolo - that's something you don't always see with these oldies. Do you have the bridge? I'm guessing it's not there because the strings aren't on at the moment. Posted by SB on Tue, 01/15/2008 - 18:00. Go ahead and fix it, the guitar is not particularly valuable. 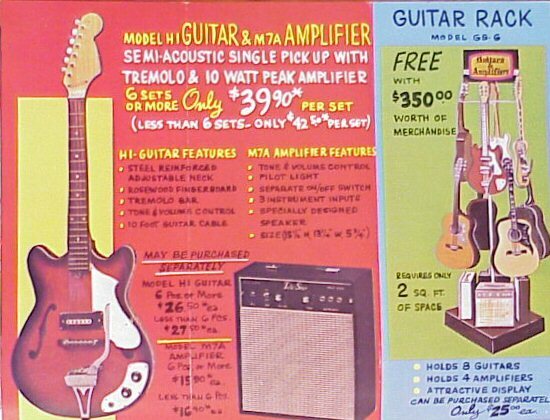 Deccas were imported from Japan by Decca records in an attempt to make a quick buck off the surge of guitar sales that occurred after the Beatles first US tour. Early Deccas were built by Teisco and later models were Kawai. I think there were a few Zen-On models sprinkled in as well. Your instrument appears to have been built by Kawai. If you are patient, you can find original replacement parts for your guitar by watching eBay. Just do a search every few days for "kawai guitar". Jedistar has posted links to Decca information on the VintAxe Forum. If you are interested you can see them here. Posted by SB on Sat, 01/26/2008 - 01:33. I saw this dealer flyer and it reminded me of your Decca. Obviously the neck and pups are different but the body and hardware look like a match. Getting a look at the bridge might help you find a suitable replacement for your instrument. The guitar in this advert is badged Telestar. Posted by ToddMFP on Tue, 01/29/2008 - 19:05.
that is the closest ive seen only difference i see is one pickup versus two and the head stock is different thanks, that bridge looks nothing like the on i bought at sam ash that is way too tall and isnt very adjustable. Ill see if i can find one of those, thanks for all you guys help!